In the release details, I also specified that ‘Wifi Monitor Mode’ button was added for using ‘Monitor Mode’ under Windows Vista/7/2008, but without giving extensive explanation about how to use this feature. So in this blog post, I’ll add more details about this ‘Wifi Monitor Mode’ and how to use it on SmartSniff and SniffPass. When a wireless network card enters into a ‘Monitor Mode’, it listens to specific channel that you choose and captures all the packets that are sent by wireless networks on your area in the specific channel that you selected. If the wireless network that sent the packet is unsecured, SmartSniff and SniffPass will be able to show you the packets data. Unfortunately, this mode is only supported on Windows Vista, Windows 7, and Windows Server 2008. Windows XP is not supported. Both the network card and the device driver must support this mode. I currently don’t have a list network cards that support this mode under Windows. However, if you manage to get your card into monitor mode, it’ll be nice if you post your card model as comment to this Blog post. Also, be aware that according to Microsoft, some Wifi drivers may cause a system crash when entering into monitor mode. First, download and install the latest version of Microsoft Network Monitor 3.x if it’s not already installed on your system. Run SmartSniff if you want to capture general TCP data or SniffPass if you only want to capture passwords. Be aware that SniffPass can only capture passwords that are not encrypted. Most Web sites and services of large companies use SSL to encrypt the passwords, and thus SniffPass cannot capture them. 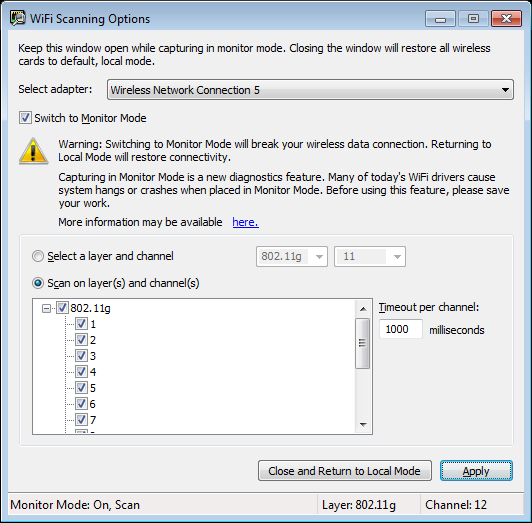 Go to the ‘Capture Options’ window (F9), choose ‘Network Monitor Driver 3.x’ as a capture method, and then click the ‘Wifi Monitor Mode’ button. In the opened ‘Wifi Scanning Options’ window, choose the right wireless card (in most cases you should have only one) and then check the ‘Switch to Monitor Mode’ option. You can now select to scan a single channel or to switch between multiple channels every x milliseconds. After you selected the desired channels, click the Apply button. The most important thing: Leave this window opened ! When you close this window, the network card will exit from monitor mode and it’ll return back to its normal state. In ‘Capture Options’ window of SmartSniff/SniffPass – select the right wireless card and then press the ‘Ok’ . Finally, press F5 to start the capture. If you have any active unsecured networks in your area, you’ll be able to see the captured data. After you finish, close the ‘Wifi Scanning Options’ window, so your wireless card will return back to normal. The information in this article is provided for educational purposes only and for making people aware of the risks of using unsecured wireless networks. it’s not intended to be used for any illegal activity. This entry was posted by NirSoft on November 8, 2010 at 3:55 am under NirSoft Tips. You can skip to the end and leave a response. Pinging is currently not allowed. Follow any responses to this entry through the RSS 2.0 feed. works with an Intel Wireless WiFi Link 4965AGN! Would be nice if the channel of the captured conversations could be shown ? thanks for your all software Nirsoft. Dell Wireless 1395 WLAN Mini-Card does NOT work. I have a TP-Link TL-WN951N which I believe has a Atheros chip(not sure) I followed the instructions and meet the system requirements but when I go to capture options and try to select Network Monitor Driver 3.x the option is grayed out does this mean no support? Forge, I’m having the same problem. That option is grayed out… Can anyone help us? I’m very glad to use this feature! Now I’m trying to do some projects with the api. However, I cannot find out how to switch to monitor mode with codes. Would you please help me? 802.11a band does not expose all available channels but 802.11n mode does reveal more “a” band channels but still not all of the band 5GHz band allocation unlike 802.11g which exposes from 1 to 14. It’s greyed out here too. what does it mean, and can I fix it? please respond…. Dell Wireless 1397 WLAN Mini-Card– not the 1395 that other guy had– works. Folks if the Network Monitor Driver 3.x the option is grayed out you need these two files. The files are Microsoft Network Monitor Driver 3.x and WinPCap. After installing them you will have the Network Monitor Driver 3.x the option. I had the same problem as you guys, option grayed out. These fixed it and it works great now. Got a Dell 1397 WLAN here, but Network Monitor Drive option is grayed out. Installed both the Network Monitor driver and the WinPCap, still grayed out. the instruction is pretty simple but it will be nice if someone can make video tutorial for this..
Works with Intel(R) PRO/Wireless 3945ABG Network Connection with Win 7. Works with rlt8187, i.e. alfa 036h and Airlive WL-1700usb cards under windows 7. To bad not working with xp. I cannot find driver for these cards with which can be spoofed mac adress i I’m stuck with windows xp. Interesting tool, I have been able to use it quite easily with my built-in LAN card on my MSI board. Love this stuff. I have Network Monitor 3.4 but SmartSniff does not allow me to check the radio button under capture options, any ideas? Fixed the above problem, however, whenever i click apply i disconnect from my wi-fi. Thoughts? Kamerad – I have the Network Monitor 3.4 problem too 🙁 can’t check the button. How did you fixed this? Same issue that a few others are reporting. I DO have Network Monitor 3.4 installed, and from netmon I’m able to capture wireless frames in monitor mode successfully. But in SmartSniff, the Network Monitor 3.x option is grayed out in the Capture Options dialog. If your operating system is 64-bit, you must use the x64 version of SmartSniff. The 32-bit build of SmartSniff cannot load the Network Monitor 3.x driver under 64-bit operating system. Help!, After going to capture options, clicking on Network Monitor Driver 3 x, and clicking on Wifi Monitor Mode, I get the message “The Handle Is Invalid”. What should I Do??????? Works perfectly with Intel Centrino Wireless N-130, Im thinking about integrating this into my bundle. work greatk on HP G60 441-US !! by the way can i cracked the password using the capture file from smartsniff? how to save the capture file? Worked with built-in Broadcom NIC 43224AG 802.11a/b/g/draft-n WiFi adapter used by HP in Win7pro with NetMon 3.4 installed. Could NOT get this combo to work in Winbuilder (stripped down version of Win7). Asus laptop qualcomm atheros ar9002wb-1ng wireless network adapter crashed after apply monitor mode.